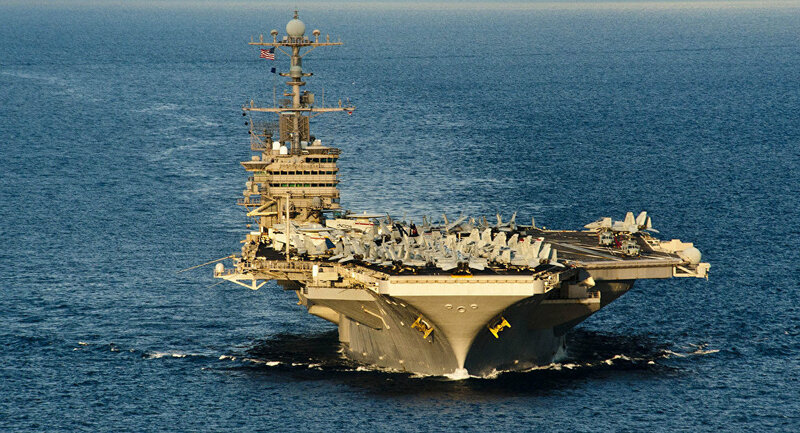 A carrier strike group led by the Nimitz-class supercarrier USS John C. Stennis has arrived in the Middle East, ending an eight month period during which a US carrier wasn't based in the region, the US Navy has reported. The carrier group will be based with the 5th Fleet, which is responsible for US naval activity in the Arabian Sea and the Persian Gulf, and will be stationed in the region for at least two months. According to the US government-funded news service Voice of America, the carrier strike group is being deployed to "help in the fight against the Islamic State terror group in Iraq and Syria and the war in Afghanistan." Furthermore, a US Defense Department official confirmed earlier reports that the US was beefing up its presence in the region as a "message" to Tehran, telling VOA that "just being there is a show of force to Iran." The carrier group's presence is expected to have a similar effect to the US base in at-Tanf, southern Syria, the official added. The US established an illegal garrison at at-Tanf in 2016, justifying the deployment as part of its war against Daesh. Damascus and its allies have repeatedly accused the US of using the base to retrain and reequip former Islamist militia to continue the war against the Syrian government. On Thursday, Chairman of the Joint Chiefs of Staff General Joseph Dunford said that the US would have to train 35,000 to 40,000 more "local forces" to "provide stability" in eastern Syria, where US-backed Syrian Kurdish forces took control following Daesh's expulsion from the region. Washington, which originally justified its presence in Syria by citing the war against terrorism, has altered its reasoning for remaining in the country following Daesh's decline. In September, Trump national security adviser John Bolton said that the US military would stay in Syria until alleged Iranian-backed militias had also left the country. Tensions between Washington and Tehran escalated in May, after the US unilaterally withdrew from the Joint Comprehensive Plan of Action nuclear deal and slapped Iran with a series of strict sanctions.